Over the past three decades, the global aquaculture industry has risen from obscurity to become a critical source of food for millions of people. In 1990, only 13 percent of world seafood consumption was farmed; by 2014, aquaculture was providing more than half of the fish consumed directly by human beings. The boom has made farmed fish like shrimp, tilapia and pangasius catfish – imported from countries such as Thailand, China and Vietnam – an increasingly common sight in European and North American supermarkets. As a result, much research on aquaculture has emphasized production for export. This focus has led scholars to question whether aquaculture contributes to the food security of poorer people in producing countries. Many have concluded it does not. Meanwhile, the industry’s advocates often emphasize the potential for small-scale farms, mainly growing fish for home consumption, to feed the poor. Farms of this kind are sometimes claimed to account for 70 to 80 percent of global aquaculture production. Our research shows that both of these perspectives are wildly out of sync with current developments. In fact, the vast majority of farmed fish is consumed in the same developing countries where it is produced, and is widely accessible to poorer consumers in these markets. Most of it comes from a dynamic new class of small- and medium-scale commercial farms, the existence of which is rarely recognized. To understand the potential of aquaculture to feed the world, researchers and consumers need to appreciate how dynamic this industry is. Fish is a rich source of vitamins, minerals, essential fatty acids and high-quality protein. It plays a particularly important role in the diets of billions of consumers in low- and middle-income countries. Many of these people are poor, malnourished and unable to afford alternative nutrient-rich foods such as fruit, eggs and meat. Throughout human history most of the fish people eat has been captured from oceans, rivers and lakes. But the total quantity of fish harvested from these sources peaked in the mid-1990s due to overfishing and environmental degradation. 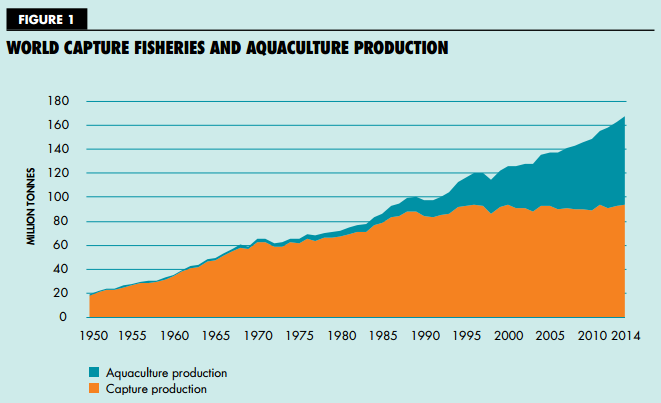 Demand for seafood has continued to increase since this time, as urbanization and average incomes have risen globally. Aquaculture is filling the gap. Academic research on aquaculture has focused predominantly on internationally traded species such as shrimp, salmon, and Vietnamese pangasius. These three fish account for less than 10 percent of global farmed fish production, but are the focus of the majority of social science publications on aquaculture. This bias reflects the priorities and concerns of developed countries that fund research, as well as civil society organizations that work to promote sustainable aquaculture production through international trade. Because they assume that this small group of internationally traded species is representative of global aquaculture, many scholars believe that fish farmed in developing nations is mainly exported to wealthy countries. The literature also suggests that fish farmers find it most profitable to grow species with a high market value, generating little benefit for poorer consumers. In a recent analysis of fish production and trade, we used data published by the United Nations Food and Agriculture Organization to show that the importance of global trade in farmed seafood has been vastly overstated. We analyzed farmed fish production and exports for 2011 – the most recent year both sets of data were available – for the 10 most important aquaculture producing developing countries, which together account for 87 percent of global aquaculture production and half of the world’s human population. Our analysis shows that export trade from these countries is relatively insignificant. In fact, we found 89 percent of the fish farmed in these countries remain in their domestic markets. But is this fish reaching the poor? To answer this question, we pieced together multiple sources of information on fish prices and fish consumption in these same 10 countries. A consistent pattern emerged: Where the quantity of farmed fish has grown substantially, the real price of farmed fish, adjusted for inflation, has fallen significantly, and the quantity of fish consumed by poorer consumers has grown. For example, in Bangladesh – one of Asia’s poorest countries – the farmed fish market grew by a factor of 25 in three decades to exceed two million tons in 2015. This growth caused the real price of farmed fish to drop by nine percent from 2000 to 2010, at the same time that wild fish were becoming scarcer and more expensive. Consumption of farmed fish by poorer households – who are particularly sensitive to changes in food prices – increased rapidly over this period, more than offsetting a decline in the quantity of wild fish eaten. These trends imply that the expansion of fish farming has been good for the poor. Low-income households in the countries that we studied would eat less fish of any kind today, wild or farmed, were it not for the growth of aquaculture. So who is producing this fish, and how? The “quiet revolution” in farmed fish supply has been driven neither by corporate agribusiness nor by tiny backyard farms. Rather, most of aquaculture’s growth over the past three decades has come from a dynamic and increasingly sophisticated segment of small- and medium-sized commercial farms and the myriad businesses that support them by supplying inputs such as feed, logistics and other services. Rather than focusing on producing expensive species for export markets or wealthy domestic customers, these unsung heroes have focused on growing affordable fish such as carp. Where these species are produced in large quantities, they have become affordable for huge numbers of low- and middle-income consumers close to home. This transformation has not yet taken hold in many developing countries, particularly in Africa, where access to inexpensive fish could greatly improve food security. By learning from the example of nations where farmed fish supply has boomed, governments and aid organizations can make better-targeted investments in infrastructure, institutions, policies and technologies to expand the impact of aquaculture’s quiet revolution.